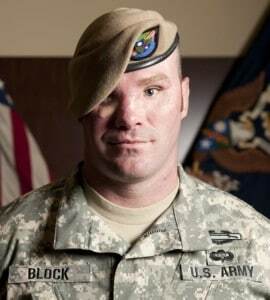 My name is Sgt Tom Block. I was injured October 5, 2013 in southern Afghanistan. 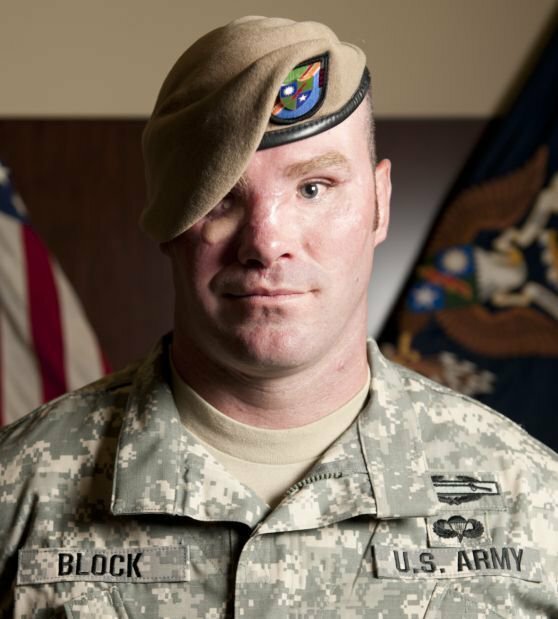 The injuries that I suffered were the loss of my right eye, limited vision in my left eye, multiple shrapnel and burn wounds, a collapsed left lung, and a broken foot. I was treated at Walter Reed Hospital in Bethesda, MD for over a month, and the Lead the Way Fund was able to assist with transportation costs for my family to be there to support me during my recovery. When I finally returned to Fort Benning, I moved into a house because the barracks were not wheelchair accessible. The Lead the Way Fund was able to provide the means to set up a fence in the yard for my dog. They also supplied me with a TV that is large enough for me to see, which is set up to our computer and will allow me to complete my degree. And then again, when I was named the 2014 Military Times’ Soldier of the Year, the Lead the Way Fund was there to show support to one of its Rangers. I can’t thank them enough for all that they’ve done over the past year. God Bless America and Rangers Lead the Way!